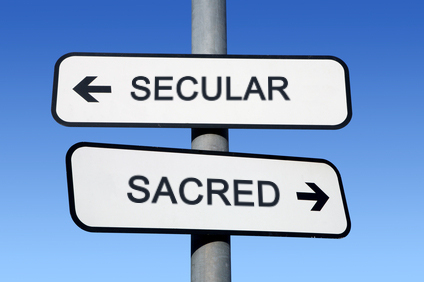 Can Secular Work Be Spiritual? Great recent question from a friend of mine who is feeling as if his corporate job in the marketplace/secular world is somehow a step-down from the work of a pastor or missionary. –Paul [regarding going to Macedonia instead of Asia Minor]: “Having been kept by the Holy Spirit from preaching the Word in the province of Asia…we concluded that God had called us to preach the gospel in Macedonia” (Acts 16:6-10). While it is often difficult/mysterious to understand God’s plans for us, once we know His command for us, doing ANYTHING other than that is a sin, is a step-down, whether it’s being a pastor when God has called you to be a stay-at-home-Dad or whether it is being President of the United States when God has called you to be a missionary to the jungles of the Amazon. The point is, if God has prepared you for the specific good work (Ephesians 2:10) of being anything else other than a pastor/overseas missionary, it is the HEIGHT of religious/spiritual work to do that very thing, be it a teacher, a baker, a lawyer, a custodian, a stay-at-home-Mom, etc. Please remember, God sent a whale to swallow Jonah, not because travelling to Tarshish was inherently sinful but because Jonah was doing something other than what the LORD had specifically asked him to do (Jonah 1:1-17). 2. Your “non-religious” job provides income so you can tithe to your local church, thus allowing the local church to carry out spiritual events like weekly worship services, earthly and eternal outreach programs to the community, etc. 3. Your “non-religious” job provides income so you can tithe to your local church, thus allowing the pastor(s) to focus more on understanding/teaching the Bible (ministry of the Word–please see Acts 6:1-4), serving the spiritual needs of people (shepherding), etc. But just as Jesus was able to focus on teaching, healing, travelling, and eventually dying on the Cross because His material needs were supported by some wealthy individuals (who probably had secular jobs!–please see Luke 8:1-3), so too are pastors and overseas missionaries able to focus on their specific work because of the material support provided by those with secular/marketplace careers. By supporting the spiritual work of pastors/overseas missionaries you become PART OF their spiritual work–literally partners with them!–through your practical contributions. 4. All Christians are called to be missionaries (Matthew 28:18-20) and royal priests of God (1 Peter 2:9), regardless of whether we are employed by a local church or overseas missions agency or public school or auto repair shop. Jesus calls all of us to be salt and light in an icy, decaying and dark world. As ambassadors/representatives of Jesus (2 Corinthians 5:16-21), we are all called and equipped to introduce Christ to others through our prayers, words, and actions, and there are some people in certain careers who will listen to you who might never listen to a pastor or step inside of a church building.